Sure, a little water on the inside of your window seems harmless—unless it's actually a sign of bad ventilation, mold, or mildew. Do you want to find the real reason for the fog? Read on for a few sanity-saving tips. Q: My windows consistently gather condensation on the inside. I wipe them down, but the moisture keeps coming back. How big a problem is this, and what can I do about it? A: The short answer? Moisture buildup isn’t a huge issue on its own. But left untreated, it can lead to more serious problems like mold, mildew, and water damage. 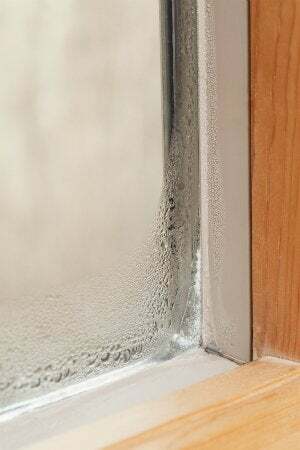 Tracking down the root cause of window condensation can be tricky, but in general, condensation occurs when warm, moist indoor air collides with a cooler surface. Because glass is one of the coldest materials in your home, excess water vapor condenses there first, causing that all-too-familiar fog effect. If the inside of your window simply refuses to dry up, we can help you track down the source—step by step. Take a closer look. If you live in an old house with equally old windows, take note of where this window condensation appears. For double- or triple-pane windows, moisture between the glass is usually caused by a faulty seal. If that’s the case, consider yourself lucky: You can correct the problem by replacing the insulated glass panel, and it’s a relatively inexpensive fix. Weatherize your windows. Whether or not you found a bad seal, preventing condensation on windows starts with good insulation. In especially old homes, adding a storm window and weatherstripping accomplishes much of what newer, higher-tech windows do at a fraction of the price. Even better, you’ll have warmer nights and lower energy bills. Those with brand-new windows or an abode built in the last decade have a little more troubleshooting to do. That’s because modern homes are more buttoned-up than ever before, and they come with energy-efficient doors and windows that greatly reduce heat loss. But if you don’t crack yours open once in a while over the winter, you could be trapping all that warm, moist air inside your house, thereby creating or exacerbating steamy problems. To get all that moisture under control, try some of the following strategies. Start with easy-to-spot sources of humidity. Plants release moisture into the air as they grow, so move them off your windowsill during the cold season. And, if you use a humidifier at home, consider turning it off in the winter, or running it less frequently than you have in the past; it may be that the air in your home isn’t so dry that this appliance needs to run constantly. Invest in a hygrometer to keep close tabs on the humidity level. Have faith in fans. Since the bathroom and kitchen are humidity hot spots, using an exhaust fan to send some of that excess moisture outside should help dry out indoor air. Most bathrooms have an exhaust fan, and the vent on your range hood can work the same magic in your kitchen. Just be sure to turn the fans on, whether you’re showering or cooking up a storm! Check for ventilation issues. 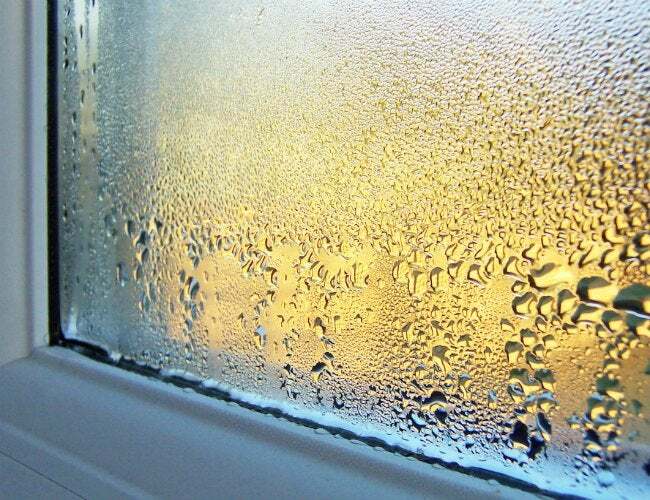 Just like water won’t collect on an empty glass, condensation won’t form on windows in a house that can’t hold humid air. Start your detective work in the laundry room by confirming that your dryer’s vent hose runs to the outside of your home. If it does (and the hose and duct are leak-free), your next stop should be your fireplace: Inspect the wall around your hearth for beading water. An unused, sealed fireplace limits air circulation, creating the perfect opportunity for mold and mildew to move in. If you notice a musty smell or discolored spots on your wall, your home may already be playing host to fungi. Hire a pro. Hey, it’s nothing to be ashamed of! If you’ve winterized your windows, ruled out the likely causes listed here, and checked for ventilation problems, hiring a home inspector (or a mold and mildew specialist) is your best bet. They’re trained to look for other hidden sources of moisture, like rainwater seeping into your foundation or crawl space. Moving quickly and working with a specialist will prevent further damage to your home, so it can be a smart investment.